Tag line: "Wonders to dazzle the human imagination - in a flaming love story set in titanic world conflict!" 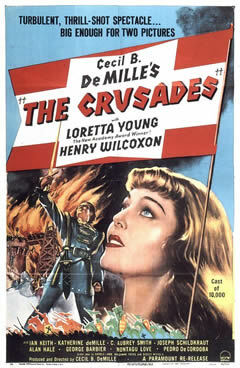 Like many of Cecil B.DeMille’s best works, The Crusades is as grand in scope as it is visually stunning. But where the film demonstrates some of the director’s strengths, it also showcases a handful of his weaknesses. The year is 1187, and the Holy city of Jerusalem has just fallen to the Islamic army of the Saracens, which destroys Christian monuments and sells prisoners into slavery. Standing in defiance of Saladin (Ian Kieth), the Saracen king, is a Holy Man (C. Aubrey Smith) who pledges to gather an army of Christians and lead a Crusade to recapture the Holy Land. Among the monarchs of Europe who swear themselves to this Crusade are King Philip of France (C. Henry Gordon) and Philip’s enemy, King Richard of England (Henry Wilcoxon). As their troops prepare for battle, Richard breaks a pact with France by refusing to marry Philip’s sister, Alice (Katherine deMille), to whom he’s been betrothed since childhood. Instead, the English king weds Princess Berengaria of Navarre (Loretta Young), a move that threatens to destroy the already tenuous alliance between the two nations. But more dangerous than the bruised egos of a few Monarchs is the army of Saladin, which has vowed to defend the Holy Land at all costs, and will fight, if needed, to the last man. Supported by remarkable set pieces, The Crusades stages a number of spectacular scenes. As the movie opens, the Saracens, having just conquered Jerusalem, hold a celebration during which they deface a giant cross and burn Christian relics in the streets. Then there’s the siege on the city of Acre, a furious battle between Muslims and Christians that’s easily the film’s most exciting sequence. This said, The Crusades suffers the same fate as many of DeMille’s faith-themed works in that it occasionally buckles under the weight of its own self-importance. There are scenes of exaggerated piety, like when the Christian woman, about to be sold into slavery by her Saracen captors, needs only to kiss the cross to find comfort. Even more distracting is the character of the Holy Man, played by C. Aubrey Smith. When he visits England to enlist its men in his crusade, the Holy Man tries to sway them by bellowing, “Lift up your swords not for lust or gold, but for the Lord our God”, adding “sons will leave their fathers and men their wives. Many who go shall not return, therefore all other earthly promises and vows are wiped away”. Smith’s pompous delivery of these lines, and all others, gets grating after a while. I actually wanted someone to slap him. Along with its pretentiousness, The Crusades also suffers from an unfortunate bit of casting. A strong, athletic man, Henry Wilcoxon certainly bore the physical stature of a king, yet not the personality of one. Best known to modern audiences as the Bishop who has a run-in with a bolt of lightning in 1980’s Caddyshack, Wilcoxon is very wooden in the role of one of England’s most popular monarchs, and falls well short of capturing Richard’s boisterous personality. Shortcomings aside, The Crusades is still an entertaining film, and provides an early glimpse of the talent its director would bring to fruition in such later epics as Samson and Delilah and The Ten Commandments. On Twitter, you post fascinating facts about each movie -- in this case, that a stuntman fired an arrow at the director -- that you do not include in your reviews. Fleshed out, these factoids would add quite a bit to your reviews. Just an idea. I love your project -- keep up the good work. Sean: Thanks for stopping by, and for the comment. Your idea is an intriguing one. It might require that I change up the way I do things (many times, I find these facts, especially the most interesting ones, AFTER the writing is done), but it may be worth looking into! And I appreciate the kind words... glad you're enjoying it! Take care, and please stop back again!